I awoke in Wooler to a clear, sunny day. The hosts at the bed and breakfast prepared an enormous breakfast (which seems to be normal around here): juice, cereal, yogurt, fresh fruit, toast, tea and a huge platter of eggs, sausage, bacon, tomato, and mushrooms. I declined the offer of black pudding, smoked salmon and a host of other lovely additions because I could never eat it all! I packed up and got back on the trail out of town to find that today’s route was rather dull compared to yesterday. After an exhilarating day in the mountains the sunny English countryside was pretty, but tame. Good thing there were lots of gifts in store for me anyway! First there was music. As I walked along farm after farm, I put my earphones in and listened to some great songs. Some were quiet (“I’m pulling through and it’s because of you…”) and some were so exuberant I dance-walked my way along (I even did the actions for YMCA!) When I finally turned it off I couldn’t believe how far I’d travelled without even noticing my blisters. Then there were the cows. I have learned to stop often, every two hours or so, to eat and drink. When I walked through a little hamlet called West Horton, some cows came alongside me at a stone wall. I called a hello to them and kept walking. But they followed me, running to the next spot in the hedge where they could see me. I laughed and kept going. Still, they ran–a whole herd of them, brown and black and friendly–until my path turn away from their field. I decided it would be nice to have company for lunch, so sat down at their gate and got out my sandwich. 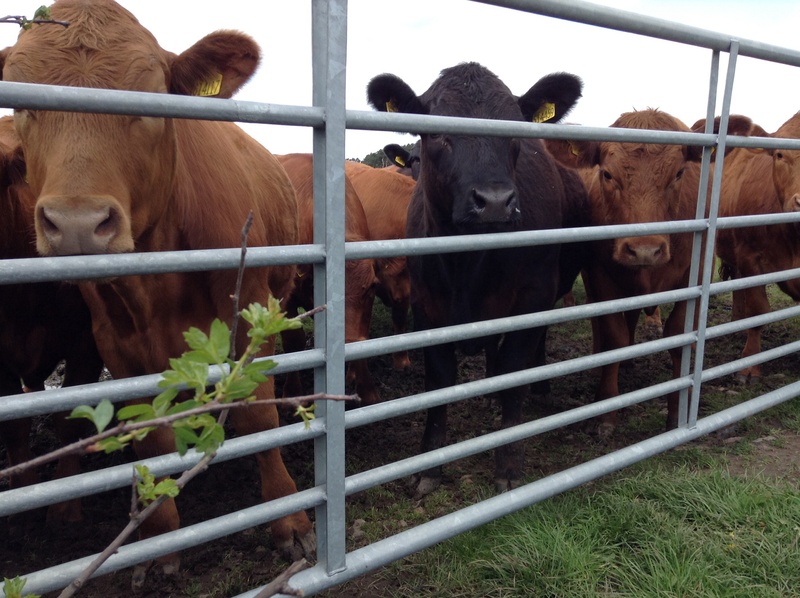 They crowded around and stayed with me, mooing and staring (politely, of course) until I finished eating. I was sorry to say goodbye. Perhaps most of all today, I enjoyed the gift of time. There were hours of uninterrupted time to think, make lists in my head, talk to God out loud, sing old camp songs, listen to the birds. Without a demanding trail to navigate, I could look up into the clear blue sky. 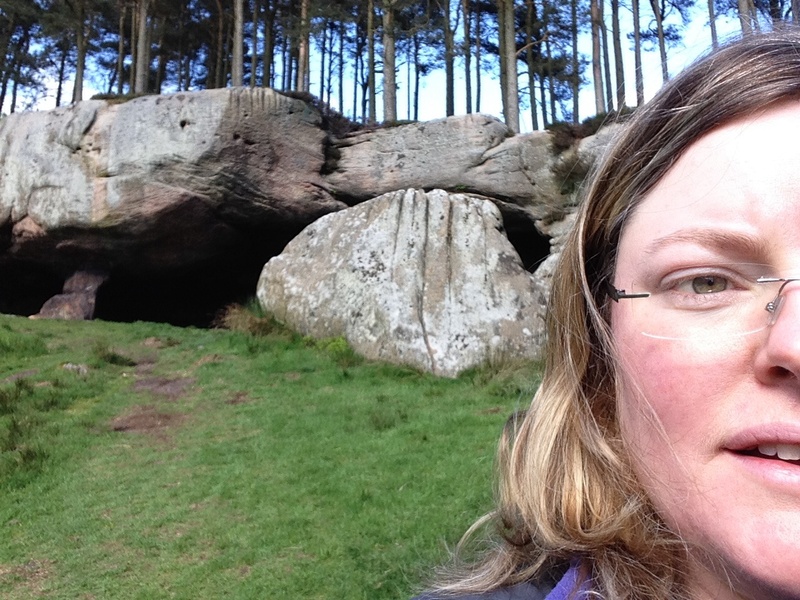 I stopped into Cuthbert’s Cave, a huge set of rocks where monks found refuge when fleeing from the viking raids, so named because among their valuables was the preserved body of St. Cuthbert. Then, near the end of the day, I came over the crest of a hill and caught my first glimpse of the sea, with Lindisfarne far away in the distance. I still have a fair bit of walking ahead, but my destination is within sight now. Part of me is relieved (my feet, mostly!) and part of me is disappointed that this part of my journey will end so soon. Just past the tiny hamlet of Fenwick, I left SCW to find the Lindisfarne Inn where I would stay the night. I gladly received the help of J., a lovely retired woman who drove me along a short but very busy stretch of major highway. Her daughter had walked SCW from Melrose, too, she said. There was one more lovely gift waiting for me at the end of my day: a hot supper, the first one in three days, and plenty of time to sit and savour it. Yes, the gift of unhurried time is a precious one. 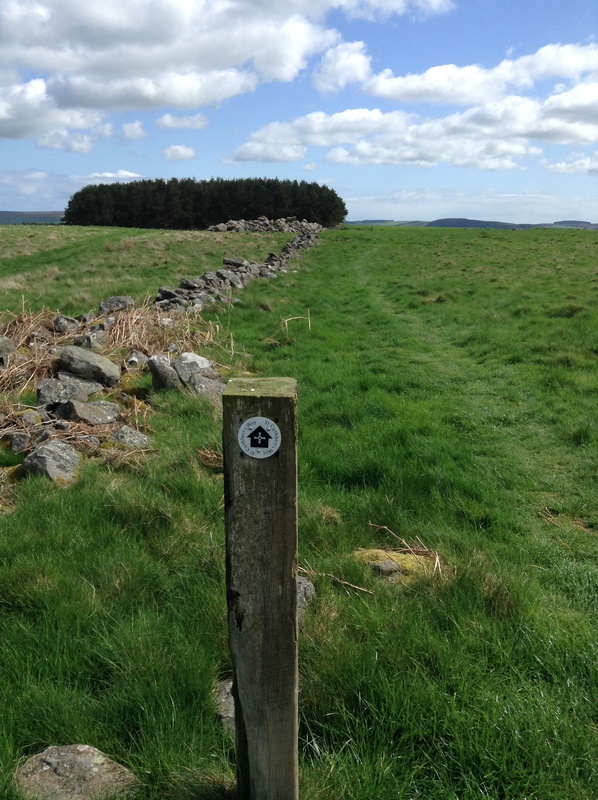 This entry was posted in Uncategorized and tagged God, nature, pilgrimage, St. Cuthbert's Way. Bookmark the permalink. Praying for your journey! Loving these posts.